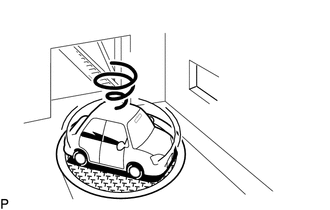 (a) Check with the customer if the vehicle has been turned by a turntable. Vehicle has not been turned by a turntable. If the vehicle is turned on a turntable with the ignition switch turned ACC or ON, the system may store the angular velocity. As a result, the vehicle position cursor may deviate. In this case, the vehicle position cursor will return to normal by turning the ignition switch off and back to ACC or ON again with the vehicle completely stopped.